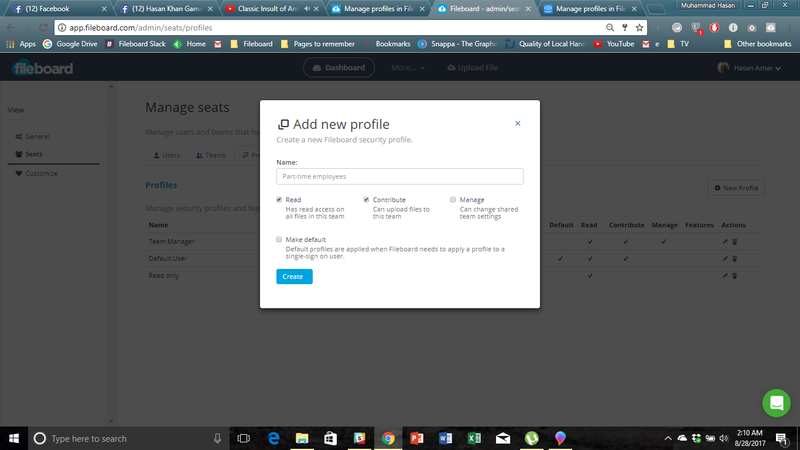 To manage profiles click on Admin. Now click on seats and then click on the Profiles tab. To add a new profile click on the + New Profile button. To edit an existing profile click on the edit button. When you click on the + New Profile button (step 1, image 2) you can add a new profile to Fileboard. You can do so by filling out the name of the profile and checking the boxes with the appropriate access levels. To make the newly created profile the default profile which Fileboard applies to single sign on users when needed, check the Make default box. When done click on the blue Create button. To edit profiles in Fileboard click on the edit button under Actions. Update the name of the profile, the access levels of the profile and whether or not you want to make the selected team the default team. Also, use this section to update what features of Fileboard this user can take advantage of, like, performing live meetings, creating file links, scheduling meetings, sending emails and the ability to send out mass emails. Click on the Update button. To delete profiles in Fileboard click on the delete button under Actions and confirm you want to delete the specific profile.